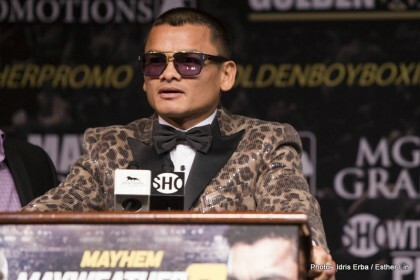 Since earning a pair of career high paydays in back-to-back world title challenges to Floyd Mayweather, Marcos Maidana has been relaxing and enjoying the good life back home in Argentina with no serious signs of return, although according his to manager, Sebastian Contursi, ‘Chino’ will indeed be back in action sometime in the early part of 2016. It’s also possible when he does make his return that the Argentine former 2 weight champ will be looking to capture world honours at a third weight – 154lbs – making him the first Argentinian boxer in history to achieve such a feat. It’s been a year now since Maidana’s 2nd fight with Mayweather and in that time the all-action brawler has been devoting his time back home primarily towards family, getting hitched to his girlfriend and enjoying married life without worrying about the rigours of full time training and keeping in shape. Recent pictures of the slugger showed he had ballooned in weight to such a degree that a 2015 return simply wasn’t feasible, although it seems that is about to change and he will soon look to hook-up with trainer Robert Garcia and begin plotting next years comeback. “It will take Marcos a few months to get back in shape, but nothing that we haven’t seen before from other elite fighters. We will know better before the end of the year,” Contrusi added with regards to the specifics such as date and exact fighting weight.